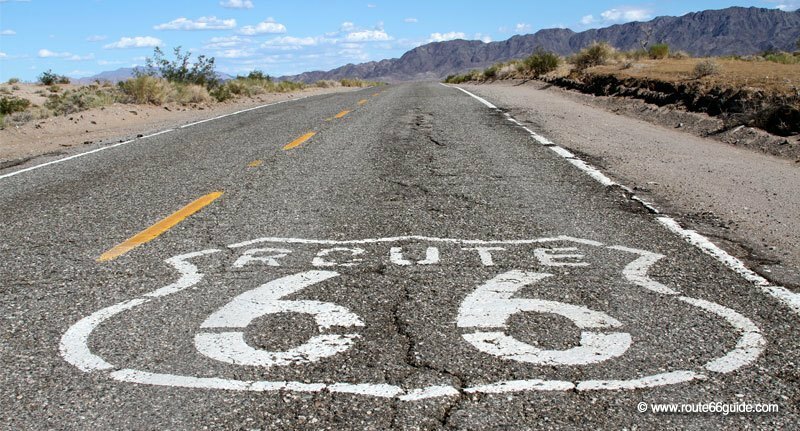 It not always easy to find the damn Route 66 as it enters certain localities and vanishes, merges with the Interstate, or simply disappears. In addition, many insensitive travelers – too many in my view - enjoy themselves by stealing route signs to carry back home. Needless to say, this is downright discouraged. Besides, we are certain custom agents, highway patrol officers, and lost travelers won't appreciate such feat. On the Internet, many sites - mainly English - provide excellent insight on what the Route holds in store for us. The numerous logbooks available, often generously illustrated, will surely be a great help, indicating points of interest and unique encounters. Above: Historic Route 66 in Arizona. 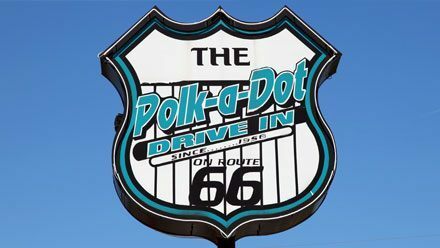 In our section "Links directory", you will find extremely accurate maps of Route 66 for all states on its path. It is possible to zoom in and analyze the route in further detail. In particular, you can view the different alignments introduced and their changes over time. If this completes your research, it would be advisable to save these documents on your laptop or tablet computer to have them on hand in case of problems. 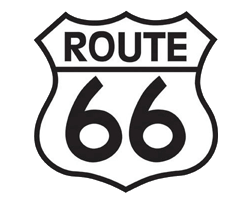 As mentioned above, it is fairly easy to lose track of Route 66. Rest assured that, at that point, finding our way back onto the Route on a hunch is nearly impossible. 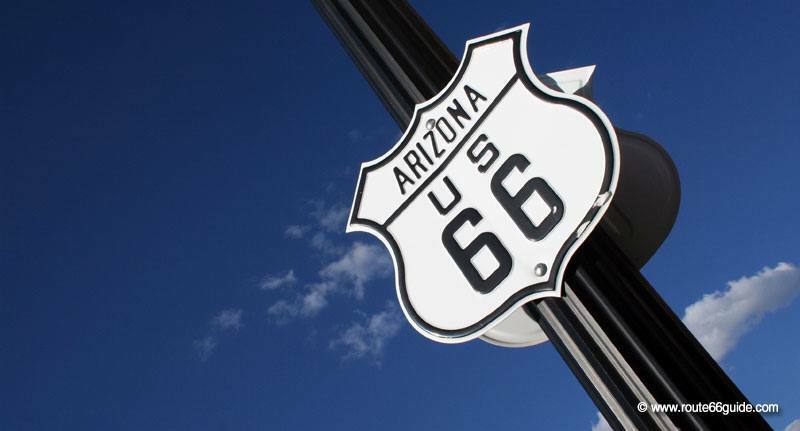 While the Internet can prove useful as a trip planning tool, nothing beats the guide of Jerry McClanahan, "EZ66 Route 66 Guide for Travelers" as travel companion. 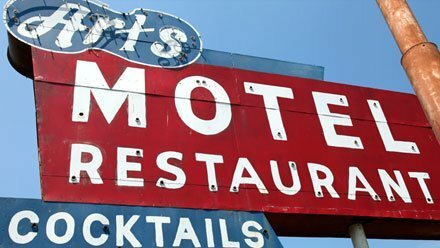 This reference work is published by the National Federation of Route 66 and is universally recognized as "The Bible" on Route 66. Everyone will refer you to it near the historic route and, even if you initially disregard it, we're certain you will eventually acquire it! In this guide, Jerry McClanahan meticulously describes the route, directions on crossroads, Interstates to follow where 66 no longer exists, the different alignments since 1926, etc. Accurate maps detail numerous localities and their main attractions - briefly summarized - in each of the eight states traversed. Mr. McClanahan, historian and artist, decorates its maps with black and white drawings. The guide is available on Amazon. 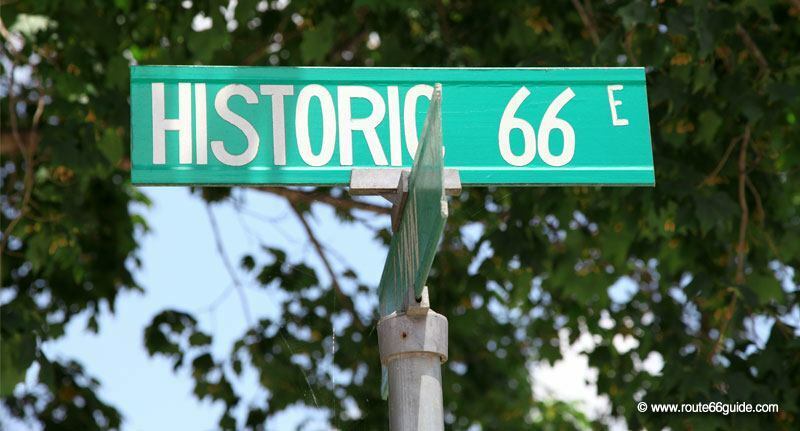 Above: Historic Route 66 in Missouri. The Route 66 Adventure Handbook of Photographer Drew Knowles from Texas can be an interesting addition. The latter focuses more on lengthy descriptions of places, points of interest, history, etc. At times, it veers off the historic route to explore surrounding areas. 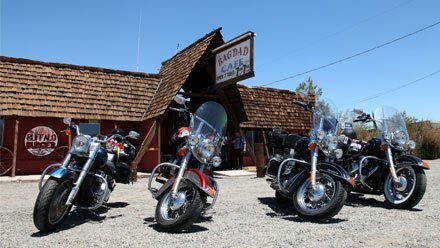 While we may have all the best reference material on Route 66 and the best maps, nothing replaces the trustworthy GPS (even at the risk of upsetting aficionados, who would rather travel using a map, as in the heyday of Route 66). The most advanced GPS identifies most of the sights, even the scenic routes part of Route 66. The GPS also provides a precise idea of ​​traveling time between two locations and allows searching within a defined area for hotels, restaurants and shops. Travelers beware though, as this damn machine, certainly a faithful companion most of the times, will tend to drive us relentlessly on the Interstate, a faster option, and thus avoid the historic road. Tip: Just disable the "highways" option in the settings and force the GPS to take smaller roads. If you bring your own GPS, do not forget to buy or update your U.S. maps before the road trip starts (there is nothing more annoying than driving to a restaurant that no longer exists or towards a route that does not exist yet!). The GPS can be rented on site, directly at the car rental office. Alternatively, you may acquire a GPS on arrival in the United States, as prices tend to be interesting (aim for stores specializing in electronics as "Best Buy"). No matter how much you trust your GPS, it is highly advisable to complete your navigation tools with a traditional map (or Atlas of the states and major U.S. cities). It allows you to check your progress, distance-to-go, as well as major cities where motels and restaurants abound. The weather on the snow-capped peaks of New Mexico is a world apart from that of California's beaches. The Arizona desert is obviously unlike the agricultural plains of Missouri or the skyscrapers of Chicago. In short, your case should be a good example of "rational completeness". In other words, pack a bit of everything in small numbers. Avoid absolutely the winter as the east can be bitterly cold. In addition, numerous snowy, Route 66 passes are closed. See our section: "The Weather on Route 66". Absolutely! From Chicago to Los Angeles, you will reset your watch 3 times. Route 66 spans three time zones. Moreover, only Arizona's Indian territories change to summer time. In short, you better anticipate not to miss your check-out time, a flight, or find yourself on an empty stomach before the restaurants closed doors. 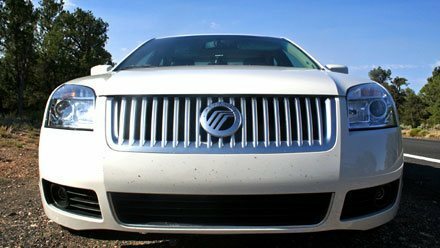 As long as you avoid the wintertime (strongly discouraged since various Route 66 segments are impassable and the east route is extremely cold), you'll mostly deal with hot climates or extremely hot in the west, in the deserts of New Mexico, Arizona and California. Therefore, you should mainly pack light clothes, not forgetting the essential protections caps / hats and sunglasses. Better add a good sweater or directly a warm jacket as the nights can be cool, including summer, especially in the high mountains of New Mexico, Arizona or California. A trade-off will also be necessary regarding footwear. Keep in mind though that sandy beaches, mountain hiking, and window shopping on chic avenues call for several footwear "styles". Buy any large and heavy products such as shampoo, soap, sunscreen, etc. directly upon arrival in the United States and leave them behind as you head back home. As above, this saves some precious grams in the suitcase. Do not forget that any extra weight you intend to airlift will cost you dearly. Check the maximum weight allowed with your U.S. inbound carrier - it varies by company. Before leaving the United States, weigh your luggage at the hotel with a bathroom scale (if the room does not have one, please contact the hotel reception as they can probably get one) and distribute the weight differently if necessary ... or let go of some of your precious possessions! The popular coded mini-lock that travelers love to hang from their bags is actually prohibited (except "TSA approved"); customs employees should be able to open your bag at all times. Carry underwear or even a change of clothes in your hand luggage. If the carrier loses your luggage, these items will surely come in handy in the meantime. Reminder (but obviously necessary if we look at the number of products still confiscated by customs): liquid products over 100 ml (3.4 oz. ), blades longer than the palm of your hand, and flammable products are not allowed in the cabin. During summer holidays, it is easy to find "travel kits" to pour your liquids in small 100 ml containers (3.4 oz.). Companies are increasingly touchy about the number of luggage pieces. If they say one - or two - they really mean it! Laptop aside.